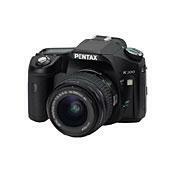 With 10.2 megapixels, this DSLR features many of the advancements that are incorporated in the PENTAX K20D, including a 2.7 inch LCD monitor, Custom Image functions for perfect control over how images are developed, and the Expanded Dynamic Range function. Compatible with any PENTAX lens ever produced and featuring Shake Reduction, the PENTAX K200D offers a high quality image sensor with the sophisticated PRIME (PENTAX Real Image Engine), a user-friendly Dust Removal system including the new Dust Alert feature, 11-point SAFOX VIII auto focus system, sophisticated 16-segment multi-pattern metering and auto sensitivity control up to ISO 1600, all in a weather and dust resistant body. Brigiht colourful images. Uses older Pentax lenses as well as modern Pentax lenses for DSLRs. Water-resistant and well built. Shake reduction. ISO sensitivity can adjust automatically if shutter and aperture are set. No button for ISO setting (set from menu); Only Sanyo Eneloops NiMh battery really effective. Build: seems to be sturdier than the competition. Viewfinder: quite good though not very bright. No DSLR compares favourably with the best film SLRs. Can use manual K-mount lenses with limited metering functions. Does not show aperture in viewfinder with these lenses. Batteries: Uses AA batteries (Alkaline, Lithium or NiMh) which are easily found. Excellent with Lithium batteries or Sanyo Eneloops NiMh batteries. Unpredictable with other NiMh batteries. Shake reduction seems to be quite effective but cannot save a hopeless shot. In-camera image processing: Acceptable but processing is best done in the computer. White balance: still a problem in some tricky lighting with all DSLR cameras and the K200D is no exception. Tungsten can be excessively cool. Manual white balance tends to be cool in strong daylight. Image quality: Colourful warm images leaning towards the bright side. Autofocus slower than competition but very accurate once it finds focus. Dust and weather proof, great in beach shooting and windy locations since Im outdoor photographer. Picture Quality - Just turn e-dial to the required settings of scene, zoom, focus and then shoot-the result is what you expected. Photography is my hobby and Pentax K200d with 18-55 kit lens is great for all occasions. The top LCD is very convenient whenever you need adjustments before shooting. Reviewing picture at back LCD is superbly bright. So many customize settings you can do for flexibility and ease of use. No problem in battery since AA batteries are always available wherever you go. Most of all: price is less compare to the camera specification-weather proof, anti blur, dynamic range and etc. Planning to buy telephoto lens for other great opportunies to shoot with this camera. Its weigth matches my grip and feel comfortably while honding it. Solid build. Felt better in my hands than the D60 or XSi. Great lens collection. from Pentax and other manufacters. Some of which can be had for a song. Easy or complicated to use, depending on your pediliction. Great camera to grow into. Could use a bigger RAM buffer, as I have found it's FPS to be a bit wanting. This is my first attempt at this. So, please bear with me. The K200D is my first digital camera. When I retired, I decided to get back into photography. I looked into the Nikon D60 and the Canon XSi. I read many reviews and adds for both of these cameras and found them both kind of limiting. IE: no braketing on the D60. So I checked out the D80 and found it's cost out of reach. In the case of the XSi. I found it's perfomance to look very good. But at the the same time I would be paying for options I would find little use for. IE: So many frames per second I might as well get a video camera and the ability to control it from a computer. Just couldn't see myself trying to drag around a laptop just to get a picture. Plus the cost of lenses for both of these cameras was VERY high. At this point I took a look at the Pentax K20D. A rugged high performance piece of equipment, but once again beyond my budget. So I set my sights on the K200D. The conclusions of every review was this. Yes it has some limits. IE: FPS a bit slow and no instant preview. But a great bargain in terms of bang for the buck, along with the best kit kens available. So I looked into lens costs and found Pentax to be the most reasonable out there, plus I could use any K mount and with a little more work, even the old screw mount lenses. A this point I was sold. I bought it from Adorama with the 18-55 kit lens for around $500 with a $100 rebate and my Wife bought me the much maligned Pentax 75-300 lens for a retirement present. So here is my impression of K200D, after a few months use. A fine piece of equipment. After getting used to the controls, I've taken some pretty impressive shots with it. Yes even with the 75-300. Plus I've had some fun on Fleabay. A Sigma 28-80 macro for $25, that works fine in it's middle range, though a find the macro setting to be a hassle.........The kit lens will focus as close without the macro switch and is sharper to boot. A Tamron 35-90 macro......Macro??? fegettaboutit. But it only cost me $20 and it too works fine and sharp in it's mid ranges of zoom and appreture. A Sears KR mount 135 macro AE with manual focus.....I over paid at $75. It's quit sharp with good contrast, but it's 3 range macro function gives a rather quirky halo effect that I haven't figured out to take advantage of just yet. Side story: I got it stuck on my camera the first time I tried to mount it, but a trip to the auto part store for a .060 shim let me get it off. I had to take the back of it apart to remove the offending Ricoh pin. So let that be a lesson. So as you can see. reasonable lenses are available that won't break the budget. Although top of the line are available at a price still less than the big 2. Ok then enough about lenses. The camera is a pleasure to use. Most controls and settings are well placed. the camera feels solid in my hands and is well balanced no matter what lens is on it. I love the 11 point AF as it allows me to compose a shot then pick my focus point. An option I'm just learning to use to full advantage. White balance and custom image options have enough settings to keep me busy for a long time to come. All in all. I have no regrets on buying this camera. Just suffering from a bit of K20 envy. The 10.2mp sensor gives me enough latitude to crop without losing too much sharpness.